[CES 2012] Kid-Tough Portable DVR To Keep Your Own Electronics Safe | OhGizmo! Kids get bored, and when they get bored they like to play with whatever is within their reach. That’s often going to be your electronics, and you know there’s nothing quite like starting the day by discovering a drool covered iPad with a cracked screen. 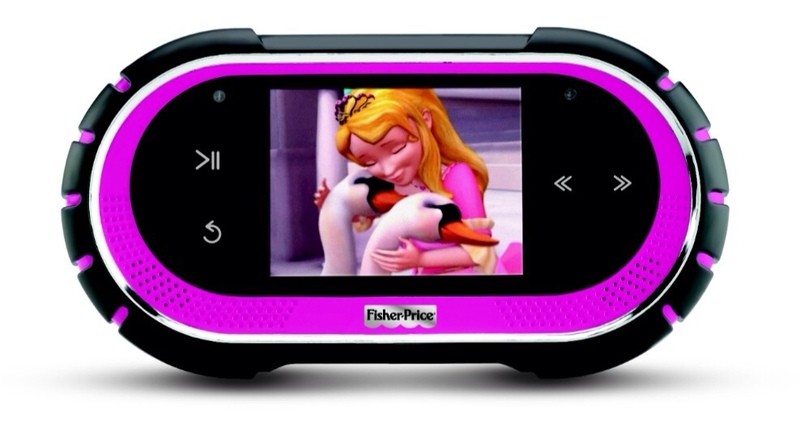 Better to keep the little ones entertained with a decoy device, one that actually does something cool, like the Kid-Tough Portable DVR from Fisher Price. It’s a bit more than a DVR, since it’s capable of playing back whatever it records through its 3.5inch screen and stereo speakers (or headphones jack if you value your ears). And the recording is done by connecting it to your TV via composite connection. We’re not talking high quality stuff here, but I doubt your 3 year old will complain that he can’t see all of Katie Couric’s wrinkles. Parents can set the device to record up to 24h in advance and even manually sort the recorded shows so they can be easily found and played back later. Onboard storage gives you 2h of recording time,but this can easily be expanded with a MicroSD card. Available in May for $150.